By way of finding ourselves—locating ourselves, as humans, in the universe, in all creation—we might begin, philosopher and mathematician Blaise Pascal considered, by recognizing that we occupy a middle ground, between the infinitely large and infinitely small. Both terms beyond our actual comprehension. Appropriate more just for contemplation. Marvels in both directions. The subject matter of the Alan Friedman and Douglas Levere photo exhibit currently on display at CEPA is/are marvels in both directions. 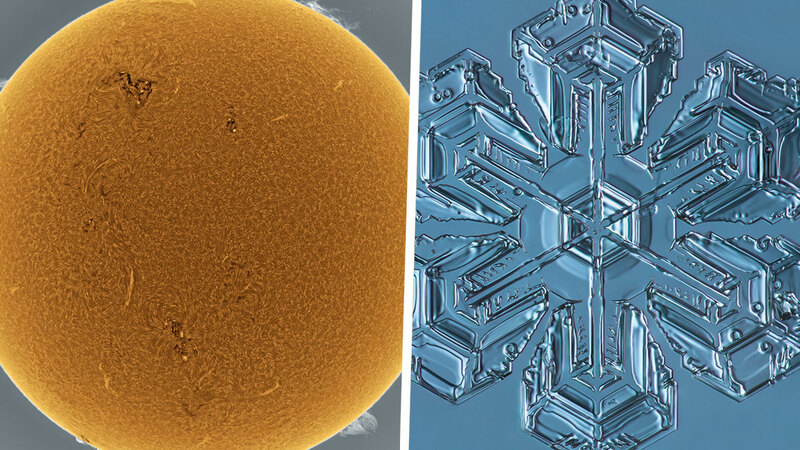 Telescopic views of the sun and microscopic views of ice crystals, snow. Spectacular photos in both cases. Of exceptional clarity and very large-format, the better to see extraordinary detail. Whole-globe views of the sun as seething disk of uniform firey activity and aspect, except for sporadic sunspot irregularities, looking like geological terrain flood washout areas, amorphous black cavities. And cross-section edge segment views, smooth and uniform firey arcs, except for occasional gaseous eruptions, aflame or as geyser-like vapor clouds. One section presents sequential shots of a massive sunspot group—measuring about 80,000 miles across, more than ten earth diameters—as it appeared to move across the face of the sun as the sun revolved. The same phenomenon is shown in photos of various light wavelengths. Full-spectrum “white” light, and deep red and near-ultraviolet areas of the spectrum. The “white” light offers the least resolution, the deep red and near-ultraviolet both significantly more, and each shows features the other doesn’t. Works by Alan Friedman (left) and Douglas Levere (right). No indication this exhibit was planned in collaboration with the Buffalo and Erie County Public Library current exhibit of great science books, but it is a fitting companion show. Galileo—his book on the heliocentric theory, Dialogo dei Massimi Sistemi—is a central feature of the library exhibit. Galileo discovered and made the first drawings of sunspots (which he viewed indirectly by means of a helioscope, a device that projected the solar image through a lens or several lenses onto a blank surface). By way of demonstrating—in conjunction with his telescopic discovery and depictions of the pocky surface of the moon—the mutability of heavenly bodies and the heavens in general. Disproving the immutability of the heavens corollary to the ancient and medieval geocentric theory. A world view in which change equated to imperfection. The ice crystal photos present a breathtaking array of artistic design variations—one more beautiful than another—on the basic hexagonal theme. From elaborate intricate rococo—spines on stems on branches, times six or times twelve—to relatively minimalist. In several instances reducing the basic hexagons to apparent triangles. Sacrificing nothing of aesthetic character in the reduction. The CEPA exhibit runs until January 2.